Creation of the islands started in 2001, only Palm Jumeirah has been completed at the time of writing (2014). Dubai’s palm tree-shaped resort island on land reclaimed from the sea will add 120 km of sandy beaches and be visible from the moon. Dubai Palm Island will include a huge amount of new property – 2,000 villas, up to 40 luxury hotel buildings, shopping complexes, cinemas and the Middle East’s first marine park. This iconic development close to United Arab Emriate’s Jebel Ali port forms a massive logisitics operation. RMJM are designing the Village Centres on the island for German-based international developers Innpro, who signed an agreement with The Dubai Palm Island developers in August 2002. These iconic man-made islands were conceived by His Highness General Sheikh Mohammed bin Rashid Al Maktoum, Crown Prince of Dubai and UAE Defence Minister. The architects were involved in the design of the Scottish Parliament building with Enric Miralles, and designed the Okhta Tower in Russia. RMJM Architects have architectural offices all round the world and are headquartered in Edinburgh, Scotland. Dubai Palm Islands comprised of around 100 million cubic metres of rock and sand and will increase the UAE shoreline by a total of 120km. The first Dubai Palm Island finished in 2006. Property on the islands has already gone on sale with residential properties on The Palm, Jumeirah selling out in a matter of days. Low interest rates and poor stock markets are making investment in The Dubai Palm attractive. The UAE government assists the real estate market, attracting wealthy immigrants to the city: much property is retailed below market value. The purchasers of apartments and villas on Dubai Palm Island started to move in at the end of 2005. Property on the islands is due to take four years to complete. 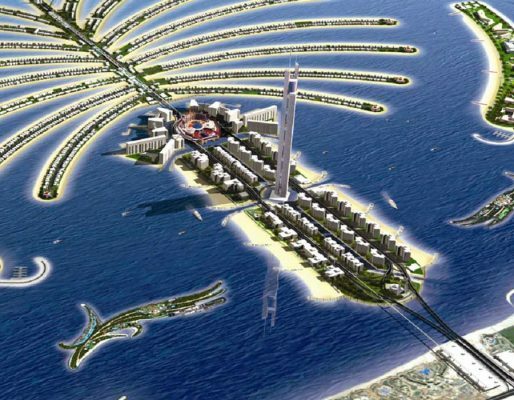 The project is being developed by a company titled Dubai Palm Developers. The supply of UAE property is not keeping up pace with demand. Luxury apartments on Dubai Palm Island are for sale to foreigners as well as Emiratis.